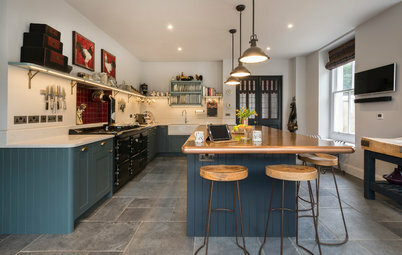 From softening hard lines to pepping up a minimal scheme, large hexagonal tiles are a brilliant way to add pattern and personality to your home. Their honeycomb shape offers the chance to create interesting formations, and they can be used in numerous ways, as these ideas illustrate. 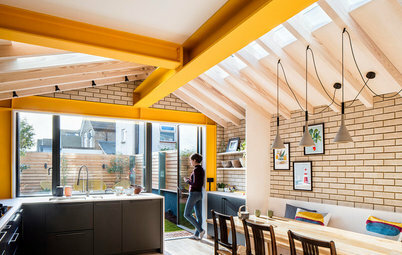 If you have an open-plan kitchen-diner and living room, it can help to subtly zone each area. 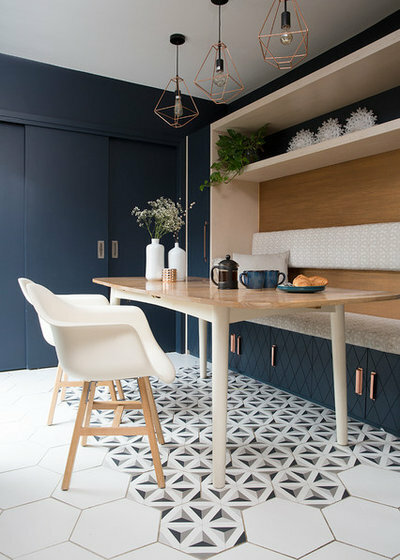 Creating a tile ‘rug’ under the table is one way to give the dining space its own identity. Here, plain white hexagons segue into patterned ones that link colourwise with the cabinetry. The six-sided tiles form a softer edge than linear ones would for a more relaxed feel. 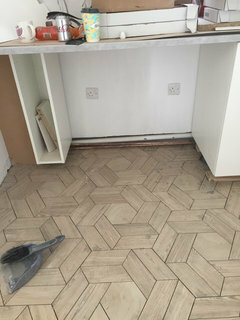 This is a similar idea, but with tiles merging into wooden floorboards. 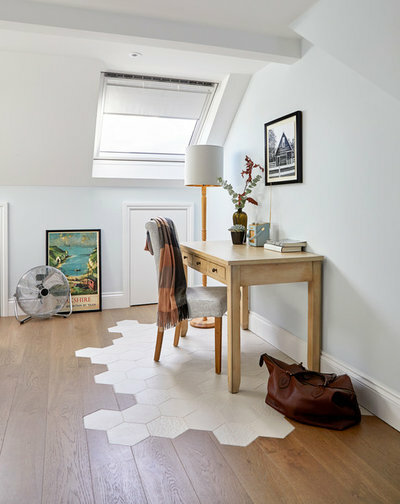 Here, the ceramics delineate a desk area that functions as both a dressing table and somewhere to rest a laptop, but this idea could also work with an office desk to help you carve out a study zone in a bigger room. 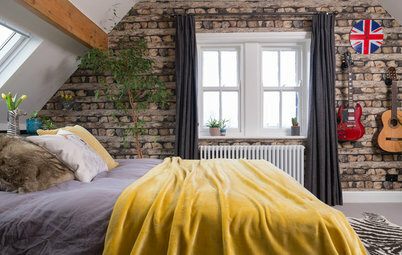 Combining the two surfaces in this bedroom was a tricky job. 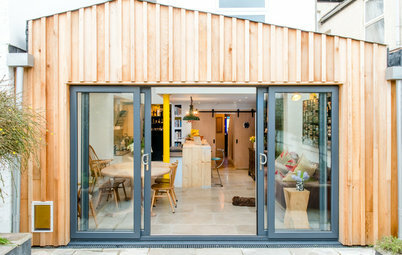 Each floorboard had to be cut exactly and the heights evened out, but the finish looks fantastic, and the hexagonal shape allows for a pleasingly fluid edge. The designers have chosen white for a neutral look in keeping with the room’s palette, but have used embossed tiles to add subtle pattern. 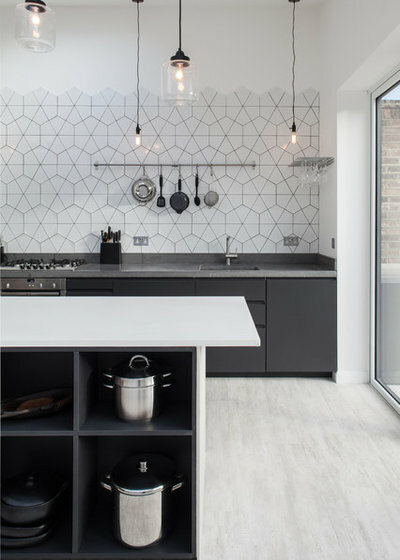 This monochrome kitchen has the simplest of surfaces – except for that wall of graphic hexagons. The subtle design adds pattern in a sophisticated way that works in harmony with the palette, as well as forming an easy-to-clean splashback. The designers have left the tops of the hexagons intact, rather than squaring them off, for a softer finish. 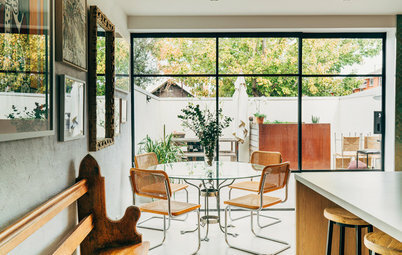 Find local interiors experts to help with your project in the Houzz Professionals Directory. 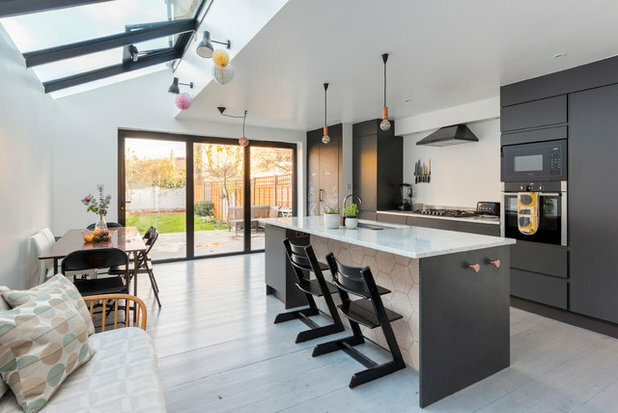 This kitchen is a masterclass in warming up a sleek design in a grown-up way. 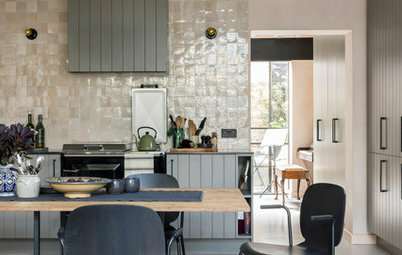 The pale pink hexagonal tiles on the back of the island both zone the breakfast bar and introduce warmth and character into the scheme – and using them here rather than in the more obvious splashback position adds a design twist. 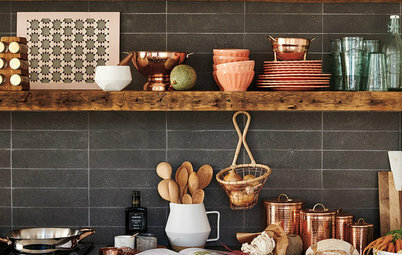 The tiles aren’t shouty, but they feel more fun than plain tiles or a painted surface might. The designers have nodded to the pink colour in the copper fittings and sofa textiles for a cohesive look. 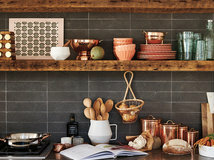 If you like a hint of country, but in a modern way, tiles like these might appeal. The colours have echoes of Delft designs, but the shape makes them feel contemporary. You could achieve a similar modern rustic effect by choosing a pretty floral design in the same shape. 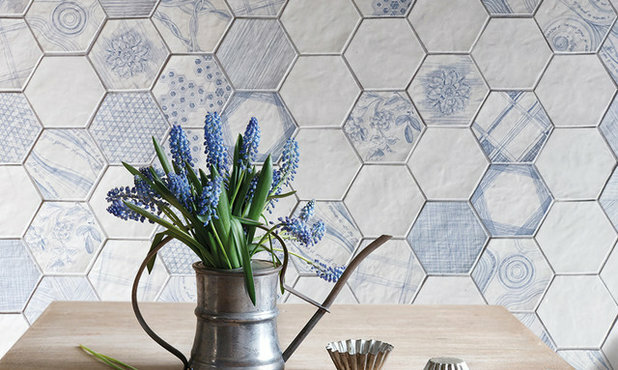 Give the established trend for patchwork patterned tiles a reboot with hexagonal versions. 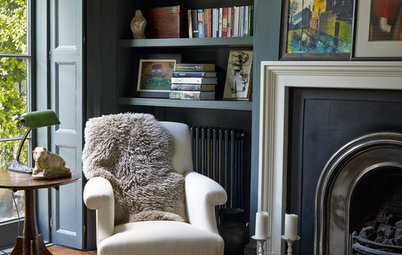 This half wall adds interest to a plain cloakroom. 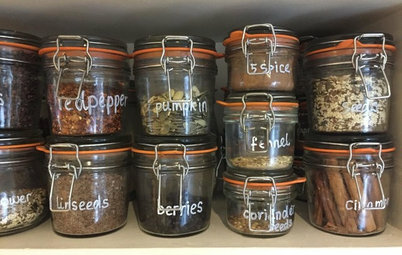 The six-sided shapes could make this mix-and-match look feel a bit too busy, so sticking with a monochrome colour scheme, as here, is a good way to keep it on the calm side of decorative. 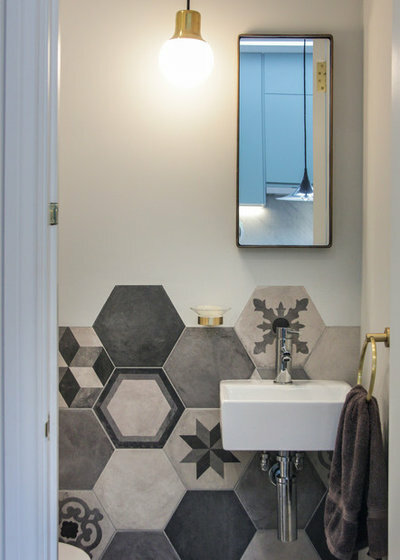 Hexagonal tiles are a fun way to add a little ombre to a space. This selection, moving from charcoal through mid and pale greys to almost white at the top, draws the eye away from the narrowness of the room and gives a sense of the space opening out higher up. The designers have mixed up the colours a little in the middle for a contemporary pixels feel. If you’re a fan of 3D-style geometrics, hexagonal tiles are your friends. 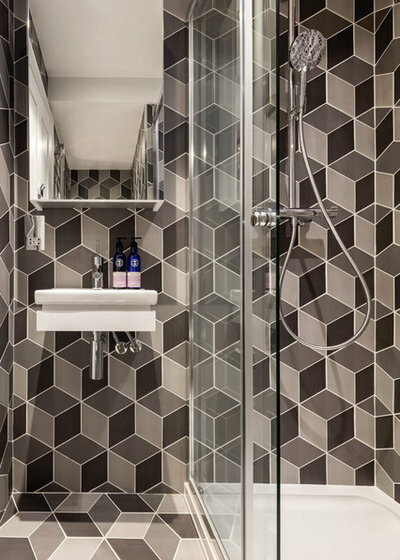 This boxy monochrome design adds real punch to this shower room. If this is too full-on for you, you could choose paler, pastel shades, or try mingling a few boxy tiles in with plain hexagonals. 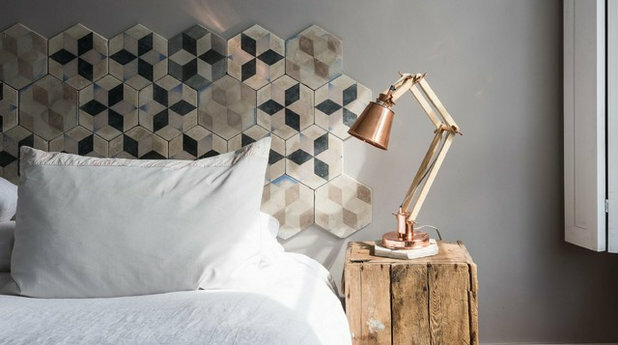 There’s no need to confine hexagonal tiles to the kitchen and bathroom – the owners of this home have used them for a characterful take on a headboard. The hexagons create a pleasing cloud shape around the bed; you could push this idea and make the shape even more amorphous. 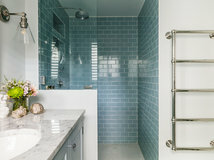 As this is a relatively small area, you could choose beautiful tiles that might strain the pocket on a whole wall, or find a home for a small batch of vintage ones. 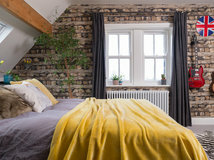 Tiles should be easier to keep clean than an upholstered headboard, but just be sure to layer up pillows and cushions so you have something soft to lean against. 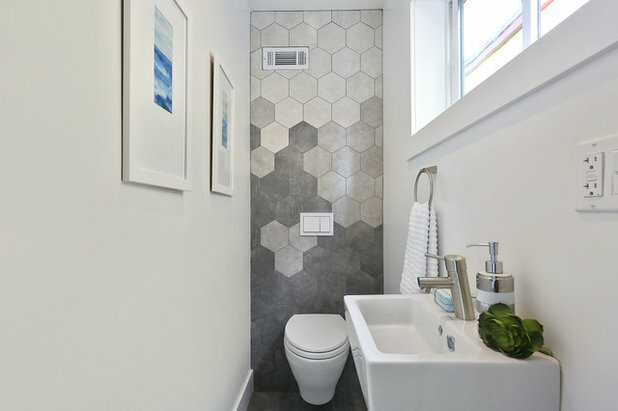 Hexagonal tiles are associated with angular shapes, but they also have a softer side, as these tiles prove. This curvy design in pale blue adds gentle pattern to the white space. 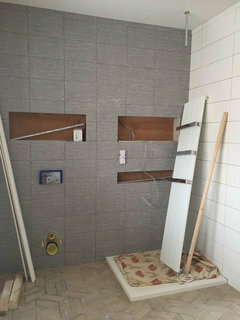 Also look out for designs that create florals when the tiles are fitted together. 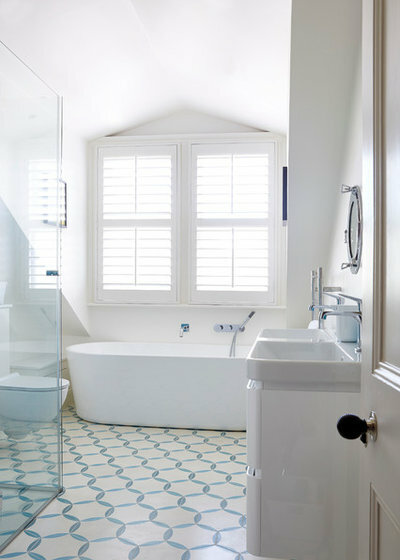 Are you tempted to use hexagonal tiles in your home? Or have you done so already? Share your thoughts and photos in the Comments section. Tell us what autumn means to you in ONE word! Just in the process of using hexagonal tiles in lots of places. 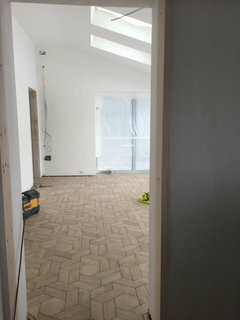 These are photos taken whilst the renovation is still in progress. O level maths confirms there are just 6 ways to use them. 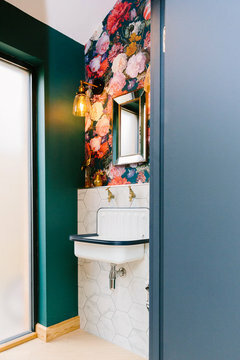 We LOVE hexagonal tiles here at My Bespoke Room you can see how great they look against the floral wallpaper in this compact toilet. Some great inspirational images as always, thanks! Property What Did the Bauhaus Ever Do For Us?